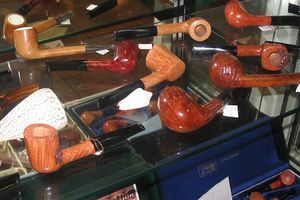 Calabria Pipe has a very long familiar tradition connected to the Mandatoriccio area, a small village placed through Sibari and Crotone, on the Ionian coast, where the practice of briar semifinished for pipes, sinks its origins in a one century long history. Vito Carlino, owner of the factory, comes from a family who has always been devoted to the manufacture of the "ciocco" (briar block), which holds within itself the power to create fine masterpieces. The working process is developed following a technique and a kind of participation completely handmade. 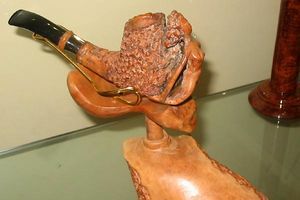 The treatment of the briar in Calabria Pipe's workshop starts from the purchase of the block of briar of Erica Arborea, up to the finished pipe. 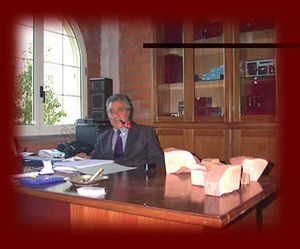 Their manufacture is not limited to the production of semifinished, but it has been expanded to finished pipes. Our philosophy makes us produce a high quality handmade pipe, to satisfy the needs of our customers and collectors with esteemed and rare pieces. To produce a high quality pipe, we believe that the most important thing is the high quality of the raw material, the briar. The natural seasoning of the briar, without artificial processing which denaturalizes the wood, is very very important. We grade our pipes basing the grading system on the grain of the briar. This page was last edited on 8 April 2011, at 07:18.